Book Club did not disappoint. Jane Austen fans will find plenty of references that are completely apropos, and for those who are a little murky on the Jane Austen novels, there is an appendix with a helpful summary of all the plots. In addition, the characters are all bright and engaging and there is a distinctly Austen-like focus on relationships and what is and isn’t accepted, what people should and shouldn’t do, and people overcoming their personal foibles – with a little help from their loved ones – to find happiness. Finishing the novel left me with but one thought: Is anyone making a movie of this? Yes. 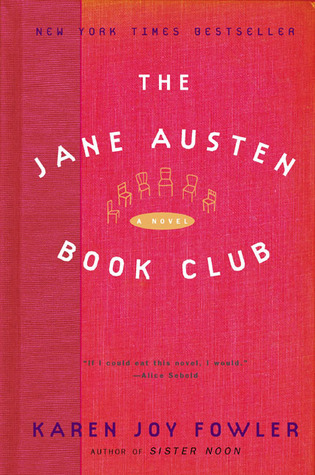 In fact, they made The Jane Austen Book Club in 2007. Book club members include Jocelyn (Maria Bello) who formed the group, the much-married Bernadette (Kathy Baker), Jocelyn’s long-time friend Sylvia (Amy Brennerman) who married Jocelyn’s high school boyfriend, Sylvia’s daughter Allegra (Maggie Grace), French teacher Prudie (Emily Blunt), and the lone male is Grigg (Hugh Dancy). Jimmy Smits plays Sylvia’s estranged husband Daniel (there’s a casting I wouldn’t have figured on). I must rent this from Netflix tout de suite, as Prudie would say. 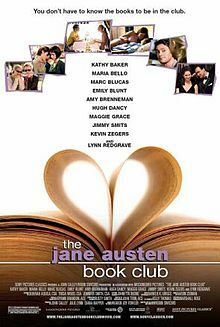 This entry was posted in Commentary, Review and tagged Amy Brennerman, Emily Blunt, Hugh Dancy, Jimmy Smits, Karen Joy Fowler, Kathy Baker, Maggie Grace, Maria Bello, The Jane Austen Book Club. Bookmark the permalink.